Sara of Nubia, a princess and free spirit in her own right, has been promised to Pharaoh Amenemhat, but she is not one to go quietly into her duties as a bride and the mother of future rulers of Egypt. When Sara and her best friend, Sobek, disguise themselves as commoners and venture out, Sara’s journey of the heart begins abruptly with a clumsy moment, a chance encounter, and a kiss born out of tradition. The stage is set for a long and harrowing struggle to be with the one love of her life and to gain back what is, and always was, rightfully hers. 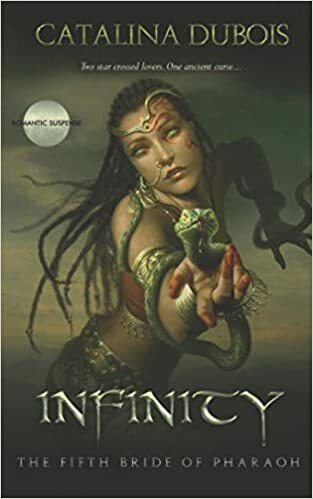 Catalina DuBois’s Infinity: The Fifth Bride of Pharaoh is the tale of Sara and Matthaios, two people destined to be together against all odds and against the destiny laid out for Sara by her family. Sara is a strong, determined, and admirable main character whose tenacity makes her an easy favorite. Matthaios, imprisoned and forced into servitude, fights with every fiber of his being not to cross the line when it comes to his charge, Sara. His ability to control his overpowering feeling for Sara and the restraint he is able to maintain is touching for his love for her is genuine. DuBois constructs some of the most moving love scenes involving Sara and Matthaios. I am not a fan of romance that contains gratuitous scenes, but DuBois has maneuvered around that type of writing to create stunningly beautiful pictures of two lovers whose hearts are truly one. DuBois has managed to change a lifelong habit of mine. I have never been a fan of the prologue. More times than not, I skim the prologue to get the gist of what is to come. DuBois, however, has written a prologue so gripping, so detailed and vivid, that I can say it hooked me within the first paragraphs. She has drawn Matthaios as a man of tragedy in juxtaposition to the horrifying Pharaoh as she quickly reveals a backstory steeped in lost love and betrayal of the worst kind. Infinity: The Fifth Bride of Pharaoh gives readers the best of both worlds with regards to genres. DuBois manages to combine romance and history with an added layer of mystery. I appreciate an element of the unknown when reading fiction of any type. Without a doubt, readers are kept guessing as to the identity of Sara’s and Matthaios’s evil shadow, and the ultimate reveal is breathtaking given the buildup of the character to that point. Another of my favorite characters is Dimp. A faithful and focused doctor, Dimp is ever willing to help Sara and her friends throughout the book. Not one of the characters who gets a lot of attention, Dimp stands out as one of the most loyal and caring in the kingdom. Romance fans and those who appreciate elements of mystery in their historical fiction will be drawn to the striking cast of characters created by DuBois. Nowhere else will readers, hungry for historical fiction, find a more well-drawn plot brimming with intrigue, adventure, and perfectly-tied together story lines.